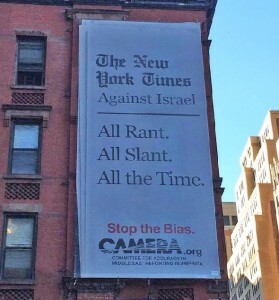 Would a great newspaper slant the news against Israel? 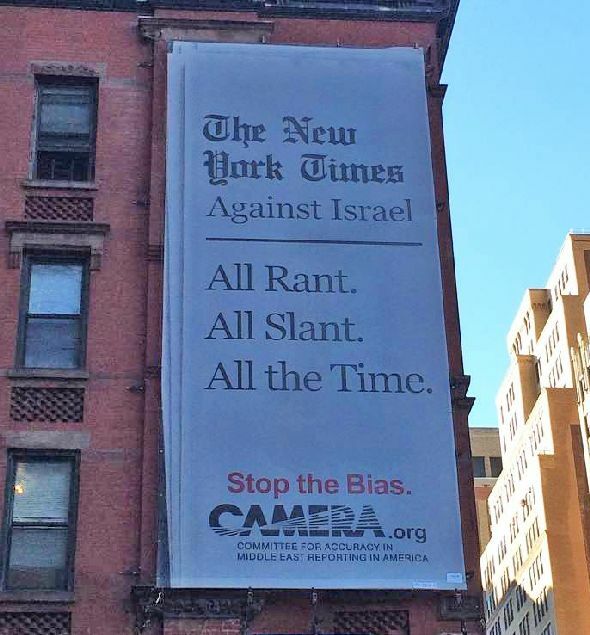 The new advertisements expand a campaign begun earlier this year by CAMERA to expose The Times’ chronic anti-Israel coverage and commentary. 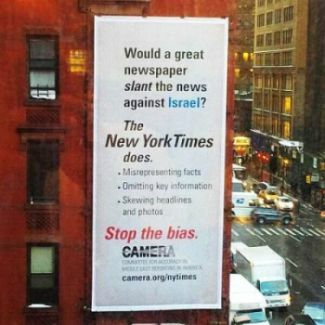 News media including The New York Post,New York Daily News and Algemeiner reported on the first billboards; some Times’ staff have commented on them on social media and in the paper. 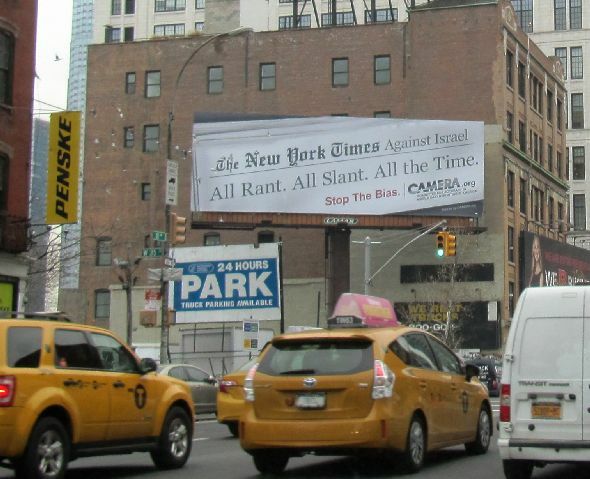 The billboard campaign forms part of the effort to let the public know, beginning with the newspaper-reading public in New York City, that The Times’ persists in its long-standing pattern of prejudiced reporting and editorializing when it comes to Israel. 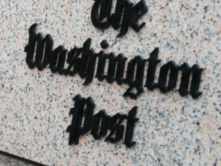 They are a quick, high-impact way of reminding viewers of the newspaper’s journalistic malpractice that has been extensively documented by CAMERA. 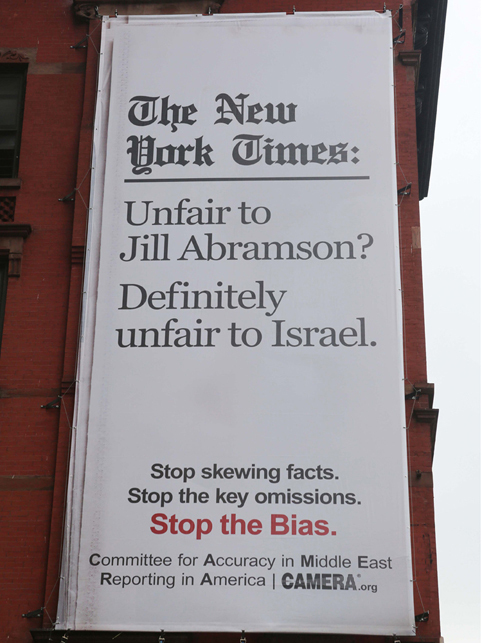 The first picture of the new billboard, tweeted out by a Times reporter as the ad was going up, had the question mark after “Jill Abramson” obscured. 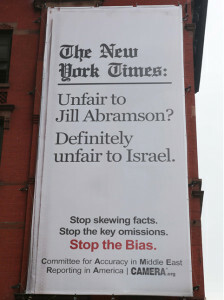 As as result, some of the early coverage assumed we were defending Jill Abramson in her dispute with the Times, which was not the case. But the stories, in the New York Post and the New York Daily News and many other sources, enabled us to reach a vast audience in the traditional media and on social media with a very clear message: the Times grossly unfair and materially inaccurate anti-Israel reporting must end. 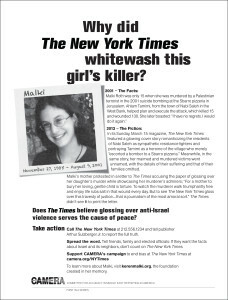 CAMERA has also published print advertisements, placed in major New York City newspapers and elsewhere, about The Times‘s history of downplaying genocidal, anti-Jewish rhetoric in the Palestinian media, and about the newspaper glossing over the murder of Malki Roth, a 15-year-old girl killed by a Palestinian suicide bomber. You can see those ads by clicking on the tabs below. 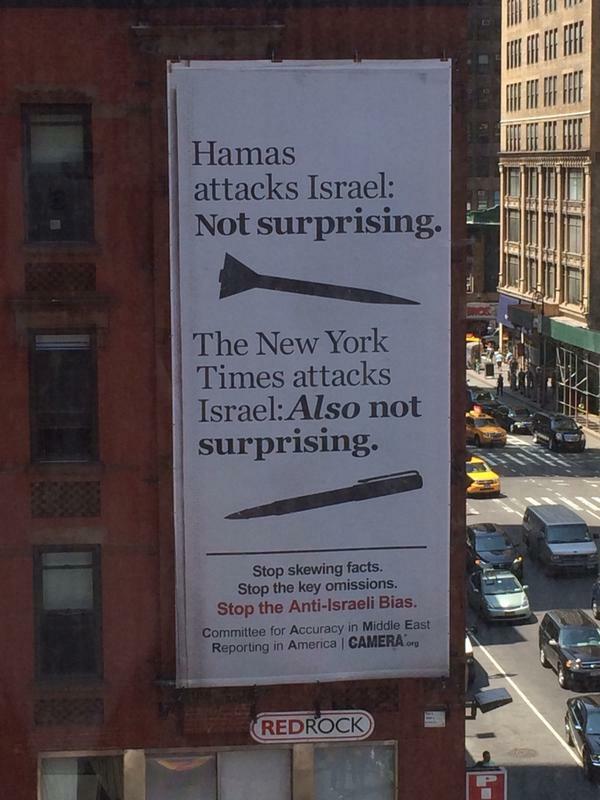 This advertisement, published in November 2011, highlights how The New York Times overlooks information that doesn’t support its narrative. To enlarge, click on the image or open as a pdf. 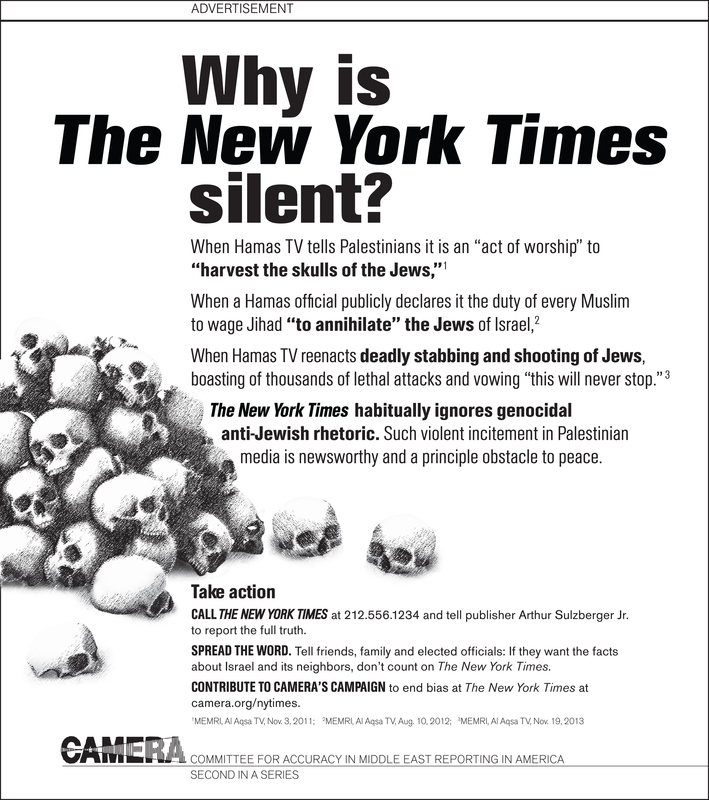 This ad, which appeared in major newspapers in December 2013, draws attention to the newspaper’s failure to sufficiently cover anti-Jewish incitement. 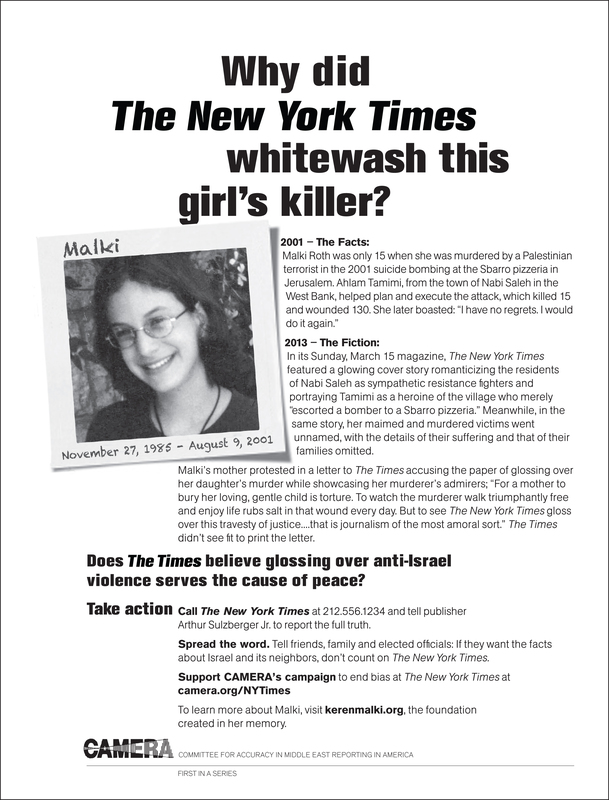 This August 2013 ad slams The Times for glossing over the murder of a 15-year-old Israeli girl, and for ignoring her mother’s letter to the editor. The examples highlighted in those print ads are part of a pattern of bias. CAMERA’s six-month study of New York Times coverage of the conflict between Palestinians and Israel found that the newspaper consistently treats Israel with a harsher standard, omits context, and shows a clear preference for the Palestinian narrative. 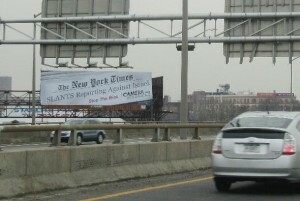 In The New York Times section of the CAMERA Web site, there are many scores of articles documenting skewed coverage by the publication. 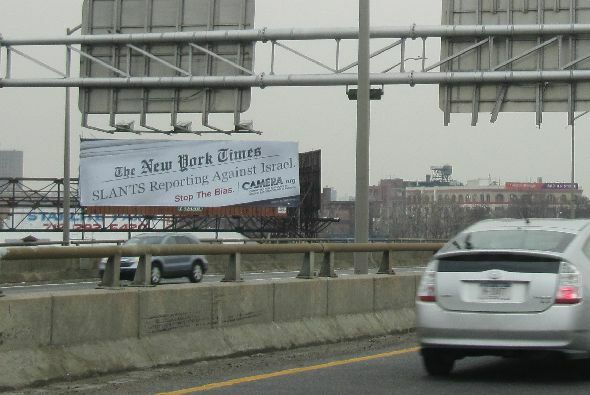 Our New York Times campaign highlights the newspaper’s habit of misrepresenting facts, omitting key information, and skewing headlines, and seeks to encourage the newspaper of record to commit itself to its own promise of ethical journalism. Below is a sampling of the misrepresentations purveyed by the publication. CLAIM: A news reporter writes: “With the peace process at a current standstill and Israel’s separation barrier and network of checkpoints long a fixture of the landscape, contacts between the two peoples have dwindled. Fewer Palestinians work inside Israel” (Jodi Rudoren, “A Tour Puts a City in Reach and at Arm’s Length,” March 26, 2013). FACT: According to easily accessible statistics at the time, contacts between Palestinians and Israelis, whether through work or healthcare, had not been dwindling, but rather steadily increasing. Figures by Israel’s Civil Administration revealed that “more than 930,000 Palestinians went through passageways into Israel in 2012, representing a continuing trend in recent years,” and that “tens of thousands of movements were recorded at passageways for the purpose of family visits and traveling in Israel, receiving medical care Israeli hospitals, commerce and employment for Palestinian workers and merchants in Israel” (“930,000 Palestinians Pass Through Israel,” March 11, 2013). The number of Palestinians granted permits to work in Israel has been steadily increasing and is at a peak since the start of a violent Palestinian intifada in 2000. The numbers of Palestinians receiving healthcare within Israel has been steadily rising as well. The New York Times was informed of its error. It chose not to correct. CLAIM: A front page article includes the following prominent sub-headline: “Kerry’s Tel Aviv Push Raises Questions About Priorities” with the clear implication that Israel’s capital city and seat of government is in Tel Aviv (“Mideast Chaos Grows as U.S. 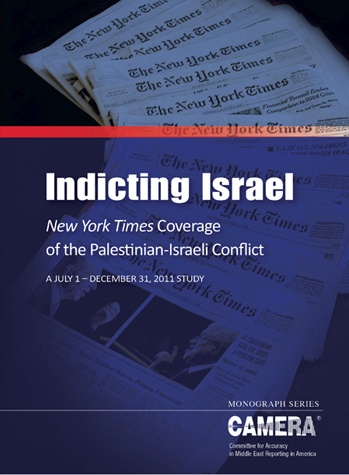 Focuses on Israel,” July 2, 2013). FACT: Israel’s capital is Jerusalem and that is where Kerry’s diplomacy and meetings took place, not Tel Aviv. 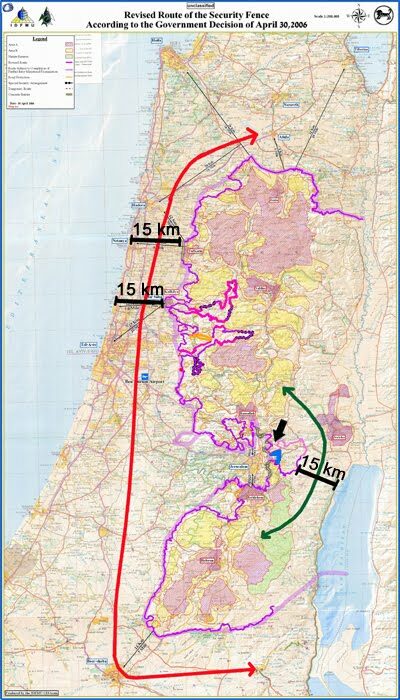 FACT: It is geographically impossible for development of the small E1 area to “split the West Bank” or prevent a Palestinian contiguous state. A look at the map below shows the fallacy of the editorial’s assertions. Although this was brought to the attention of editors, they chose not to issue a correction. FACT 1: Eric Burdon performed in concert to a packed Zappa Shuni Amphitheater in Binyamina on Aug. 1, 2013 — a week before Friedman’s column ran. 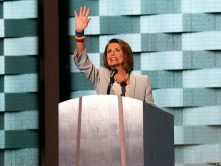 He made clear that he never joined any boycott of Israel, and that a temporary cancellation was not in protest of Israeli policies, but rather a result of threats received by his publicist. FACT 2: Rabin’s assassin, Yigal Amir, was not a settler. He lived in the Israeli city of Herzliya, within Israel’s pre-1967 boundaries. FACT 1: Mr. Sharon never entered the Al Aqsa mosque; he simply visited the Temple Mount, Judaism’s most sacred site, and the plaza upon which the mosque sits. 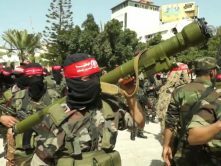 Moreover, numerous Palestinian officials have acknowledged that the second intifada was planned in advance by Palestinian President Yasir Arafat and any action by Mr. Sharon was used as a pretext. FACT 2: Israel does not retain absolute control over Gaza’s land borders. Egypt controls its border with Gaza along Rafah; Israel has no control there. 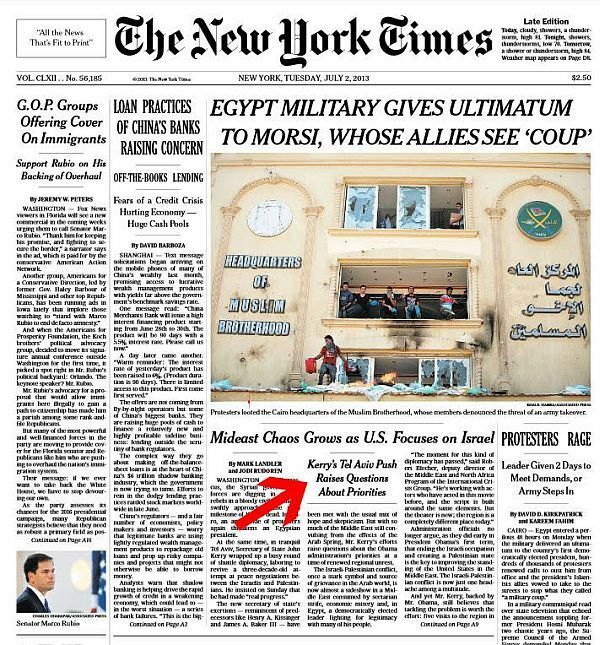 The New York Times corrected the first error on Jan. 28, 2014, but not the second error. When Secretary of State John Kerry gave a press briefing at the beginning of US-brokered Israeli-Palestinian peace talks on July 30, he placed primary emphasis on achieving an end of the conflict and an end to longstanding claims – both Israeli goals which the Palestinians have opposed in the past. 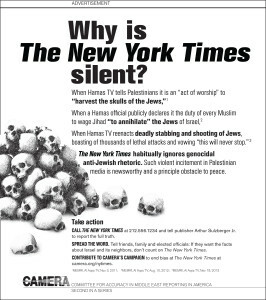 Extreme examples of anti-Israel and anti-Jewish incitement have too often been omitted from The New York Times account of the conflict. 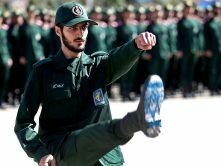 Indoctrination of generations of Palestinians to believe Israel is an illegitimate entity to be eliminated is a paramount obstacle to peace and normalcy, but a reality given little attention and credence in the publication. 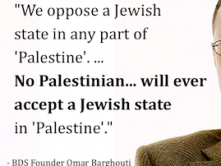 For example, when a speaker said on Palestinian television that it is “act of worship” to “harvest the skulls of the Jews,” this genocidal rhetoric was not reported by the newspaper. Many other similar instances of virulent bigotry have been ignored. Other inconvenient information is buried. After Israeli teenage thugs severely beat an Arab boy, the story made the front page of the newspaper not once but twice and journalists raised questions about the morality of Israeli society as a whole. On the other hand, when Palestinian teens perpetrated a bloodcurdling murder of five members of the Fogel family, including a 3-month-old infant, the story did not make the front page of the newspaper once, and there was no comment on the morality of Palestinian society and what might have led to the killing of children in their beds. Alongside a news story about a 19-year-old Israeli soldier murdered as he slept on a bus, The New York Times opted for an image featuring a photograph of the Palestinian killer’s mother. Although the newspaper’s public editor later admitted that the photo was the “wrong” choice, other editors decided to continue to highlight the problematic photo at the top of the story. 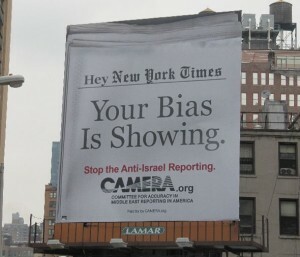 CAMERA’s six-month study of New York Times reporting found that the newspaper’s coverage of violence was marked by a double standard that highlighted Israeli attacks and de-emphasized Palestinian ones. Twelve headlines explicitly mentioned Palestinian fatalities; none explicitly referred to Israeli deaths, even though 14 Israelis were killed during the study period. A 2013 report about the Palestinian killing of an Israeli civilian and the subsequent Israeli killing of a Palestinian terrorist was assigned the lopsided headline, “Israeli Airstrike Kills Palestinian in Gaza.” The headline was later changed under pressure. But the featured photo illustrating the story was, and still is, a sorrowful picture of the Palestinian terrorist’s mother in mourning. Such errors, omissions and distortions, large and small, characterize The New York Times’ biased handling of the Arab-Israeli conflict. No. 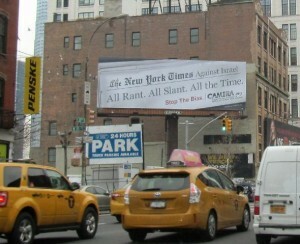 But The New York Times does. 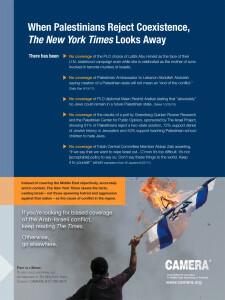 A brief video documenting examples of egregious anti-Israel editorializing in The New York Times news pages.